511 Tactical VTAC LBE Vest (58631) FREE SHIPPING! The 5.11 Slickstick® is compatible with standard molle attachment systems, yet functions like none other. The Slickstick® slides through a UV-resistant ring making it easier to arrange and attach your pouches and other gear. Slickstick attaches like a normal MOLLE attachment, but it slides to make it easier. To remove an item, just pop the snap and pull the stick out. 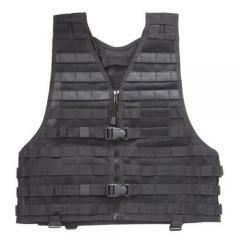 ©2002-2019 CopsPlus.com: 511 Tactical VTAC LBE Vest (58631) FREE SHIPPING!